Explore the emerging clean transportation options, and learn all about energy-efficient travel at The Clean Transportation Show during The Energy Fair! The show will feature alternative and fuel-efficient vehicles from around the Midwest. 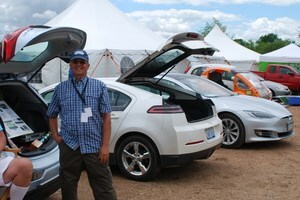 From homebrew cars that run on moonshine, to DIY electric bikes, to the latest offerings from Tesla Motors, the Clean Transportation Show holds a multitude of lean, clean, green driving machines. Do you have a mode of clean transportation that you’d like to show? Register at TheEnergyFair.org/clean-transportation-show, or call us at 715-592-6595.